April 2005, Volume 2 Issue 4 Know It - Profit! Cost You An Arm And A Leg?" Even if you're in good health, you'll still want to check-out this month's leading indices. A quick examination of these sectors could bring you some healthy profits! But, first. When is the price of gas going to top-out in the US?! Sometimes we forget the predictive power of the futures market. Like some technical indicators, it can also forecast movements in stock sectors. One commodity of particular interest these days is gasoline. 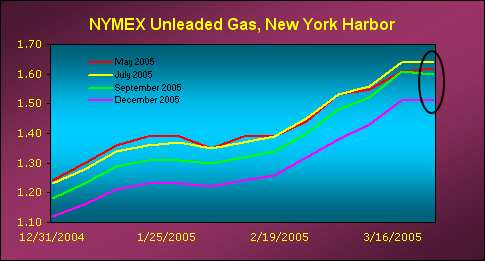 Unleaded Gas is traded on the floor of the New York Mercantile Exchange (NYMEX). If you were to take a position in one contract, you would control 42,000 gallons of gas... about 95 years worth of fuel for a mid-size car! 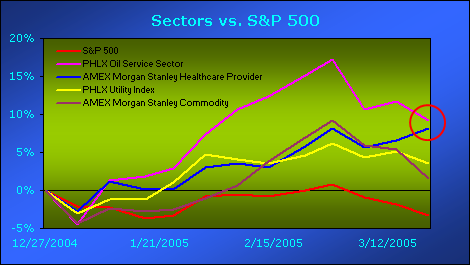 The following chart shows four contract months out to December 2005. Wouldn't it be nice if this was what you were paying at the pump? Missing from the price are the taxes and margin. Worth noting is the difference between the May and July contract months. Are higher gas prices ahead? The good news... we should see some relief going into September. Of course you know already, in the US, gas prices increase during the Summer and decline into the Autumn. But... now you can put a price on it! Not surprising, this month the Oil Service Sector is leading the way. And... oil is what helped the Commodity index move into a new leadership position. The Healthcare Provider and Utility indices round-out the remainder of the field. Although the PHLX Oil Service Sector is strong, it appears to have peaked in early March. So have the AMEX Morgan Stanley Commodity and the PHLX Utility indices. 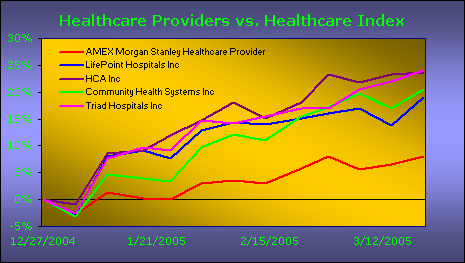 The PHLX Morgan Stanley Healthcare Provider index is the only one still on the rise. And, it has the stocks to prove it! As the Baby Boomers continue to age, the healthcare industry will continue to get stronger. Leading the Healthcare Providers sector are Triad Hospitals Inc, HCA Inc, Community Health Systems Inc and LifePoint Hospitals Inc.
All these stocks are trading near their lifetime highs. In other words, they are getting close to major resistance and may be in danger of putting in bearish double tops. 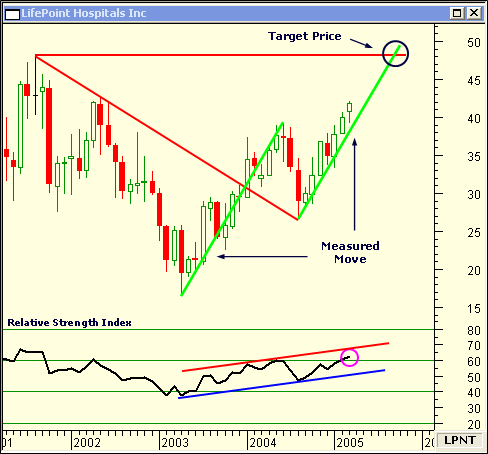 Currently, LifePoint Hospitals Inc (LPNT) is in a strong up-trend. The monthly chart shows there is more room to grow. The down-trend resistance was cleanly broken in December 2003 and later became support last summer. A measured move, where each leg is equal, could add another $6 per share by August. The Relative Strength Index lends credibility to this forecast by recently moving above 60. When the price target of $48 is realized, tough resistance could have the bulls pocketing some cash and the bears coming out to feed! Look for an update in September's Chart Wealth. Since the February 2005 issue of Chart Wealth, Beazer Homes USA Inc (BZH) (View Chart) had a 3 for 1 split... bringing it down from its lofty levels. But, that didn't stop it from blowing past my conservative price objective of $52.96 ($158.89 before the split). Five weeks later, BZH rocketed up almost $10 per share... three times my price objective! The stock peaked at the end of the fifth Elliott Wave up, before beginning its corrective wave down. Eventually, you would have taken profits on 3/10/2005 when the stock gapped down to its supportive trend line... pushing the Relative Strength Index below 50. This also coincided with an eight percent decline from the high -- a popular money management stop. In retrospect, the ascending triangle which began forming in mid-December and completed at the end of January would have been a better forecasting pattern. Now, BZH is down almost 15 percent from its high. Remember, I pick only one sector to focus on in each issue. The other noted sectors in this issue are leaders, as well, and should be researched thoroughly for trading opportunities. Also, be sure to visit Market Metrics for more trading possibilities.